Currency Converter from OANDA converts currencies between various international denominations for 180 currencies and 4 metals including the US Dollar, Euro, Japanese Yen, Pound Sterling, and other world currencies. The source of the data is Currency Source. Rates are filtered daily based on information supplied by leading market data contributors. The app keeps a history of the last five currencies you used for easy reference. Choose either the Interbank rate (rarely available to the general public), or a percentage add-on to better approximate the actual rate charged by your bank or credit card company. See details where you can see buy and sell rates for both currencies. 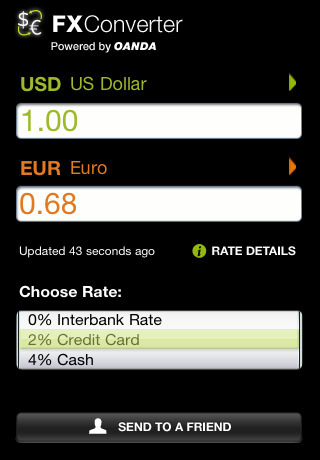 AppSafari review of Currency Converter was written by Joe Seifi on December 26th, 2007 and categorized under App Store, Calculators, Finance, Utilities. Page viewed 8913 times, 1 so far today. Need help on using these apps? Please read the Help Page. Usefull app for travellers !